Lina is spending the summer in Tuscany, but she isn't in the mood for Italy's famous sunshine and fairy-tale landscape. She's only there because it was her mother's dying wish that she get to know her father. But what kind of father isn't around for 16 years? All Lina wants to do is get back home. But then Lina is given a journal that her mom had kept when she lived in Italy. Suddenly Lina's uncovering a magical world of secret romances, art, and hidden bakeries. A world that inspires Lina, along with the ever-so-charming Ren, to follow in her mother's footsteps and unearth a secret that has been kept from Lina for far too long. It's a secret that will change everything she knew about her mother, her father - and even herself. I love this book! It has so many plot twists and almost relatable text in some way that it draws you in and makes you want to read more! On the other hand I did predict the ending at the begging of the book but it was still amazing the here the middle and the other plot twists. The narrator of the book was also very good and made me enjoy the book that much more! Great story! Clean, simple writing easy to follow and not complicated. Fun story for summer listeninf. This book was fantastic! I couldn't put down. I recommend it for an enjoyable listen. If you're 17 and you like things like awesome, totally, and duh you will probably enjoy this predictable story. The premise of the story was alright, but the book itself was incredibly boring and cheesy. Lina was whiny and annoying, and there really wasn’t a sense of romance. If you’re looking for something that makes you want to listen through to the end and wondering what will happen next, this isn’t the one. I loved it one of the best love story ever!Waaaaaaaaay better than twight.It was so brilliant! Although there were some twists and turns, it is predictable. Do read this before you visit Florence Italy though - it will give you so much to look forward to! This book is soo amazing! but u need to be 12 and older!its so amazing though! 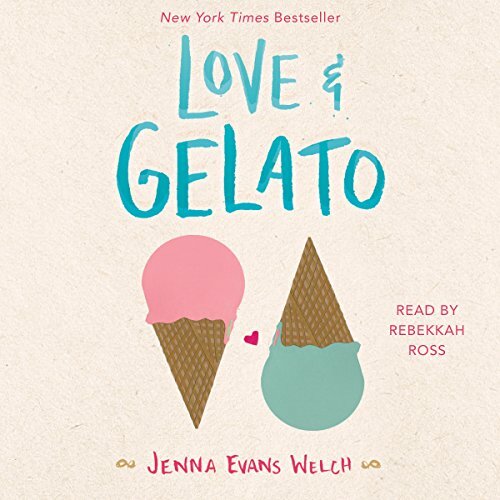 Love and gelato was a very good book to listen too. Rebekkah Ross narrated it wonderfully.